It’s here! You can buy on line, or from stores in Alaska and beyond, in Washington, Oregon, and Idaho! 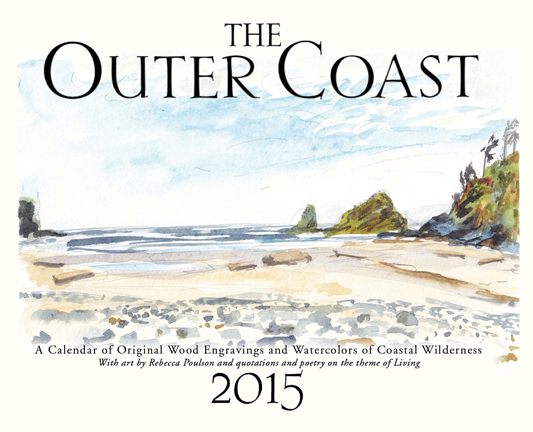 More about the calendar, as well as original prints and notecards, the order form and more are at my website The Outer Coast (theoutercoast.com). I’ve published the calendar since 1995, and in full color since 2008. I am very proud of it being printed in the United States, in fact in Juneau, Alaska, at the employee-owned Alaska Litho. Here is a slide show of the other images in the calendar. The poetry and quotes are by Alaskan poets Caroline Goodwin, John Straley, Pete Weiland, young poet Anja Brooks-Schmidt, with classic lines from Ralph Waldo Emerson, Edward Lear, William Wordsworth, Gerard Manley Hopkins, and Walt Whitman, on a theme of being in the moment. I think it’s the best yet, but I always think that. Enjoy.